Propriety aside, how do you hold a funeral for a friend? For Bennett Bay, it means nothing less than an immortalisation in sound. 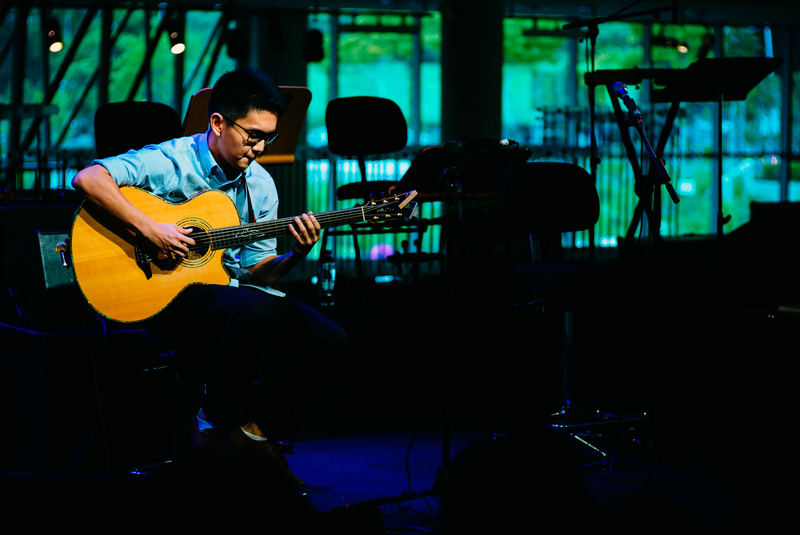 This Sunday, at The Esplanade, the young singer-songwriter will lift the veil over his second album In Memory Of. Befitting the gravity of its subject, its songs will be presented by a 17-piece band that will mine from a spectrum-blasting array of baroque and post-rock sounds to give life to Bay’s words of commemoration and commiseration. Bandwagon speaks to Bay ahead of the big day on what the occasion means to him and the new music he’s on the cusp of releasing. What’s the story behind In Memory Of? It’s an album I wrote for a friend. He passed away in 2013, during our last year in SOTA. I’ve been working on it since then. I wrote four of the songs in the album first in the year after he passed. Towards the end of last year, I decided to release it this year and get it out there, so I wrote more songs to develop it further. Given that it was deeply emotional and trying experience, what was the most difficult part of the process for you? It’s been difficult throughout. The writing process was tough – it wasn’t like I could look to others for feedback because it was more for me to process what had happened. Besides that, I just kept changing parts of it the first three to four months. I’d write and re-write and swap out instruments. It took a while before I settled on what I wanted. And even when it felt right, the mixing and rehearsing processes were hard for me, too. During those times, I’d get reminded of all the years that have passed without having that person there. It’d be nice if he was here and we were making music together. He was a really good guitarist and was the one who introduced me to post-rock bands such as Explosions in the Sky. For any artist, having an album out is a joyous milestone. Is it the same for you, in this case? Besides honouring my friend’s memory, the release of this album means that I can write new material. I have written my next three albums already. They’re more lighthearted. But I have to get this one out first. This and my first album, which I wrote for my family, are the ones I wrote specifically for other people. You’re going to be playing at the Esplanade Recital Studio with a massive 17-piece band. How do you think it’ll be like for the audience? Yes, there’ll be 17 musicians but not all of them will be on the same song at once. They’ll be playing the first four songs I wrote back in 2013, the ones I started this album with. I wanted something that sounded huge. My previous album was more folky – strings with acoustic guitars here and there. Imagine yourself in a field: That’s the kind of music you’ll hear. But this album is the music you’ll hear when you’re sitting in a park while it rains and you’re looking out into the sea. It’s a much darker and grander sound. All the songs here started more or less the same way: On guitar, as songs written for a band. I gradually added more layers to them, especially with strings and horns. There seems to be quite a strong focus on classical music in the album. That’s definitely a conscious decision on my part. I made sure that most of the instruments used were more acoustic. This is my way of rationalising it: I wanted the instruments to be ‘real’ and ‘down to earth’; instruments that had existed long before technology, reverb and things like that. That was the musical basis of my first album as well. At the root of it all, I'm trying to make and understand music on simpler, deeper level. Bennett Bay’s In Memory Of album launch happens this Sunday, September 9, at the Esplanade Recital Studio. Tickets are available here.